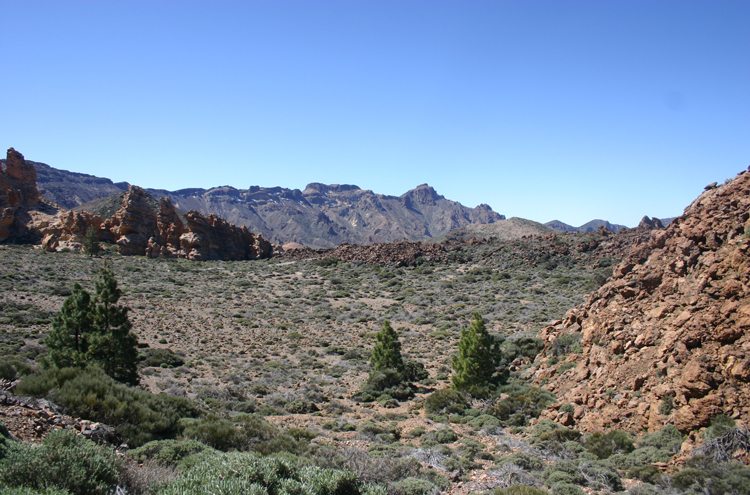 Guajara is, in our view, the outstanding walk in Tenerife's undoubted highlight, the Las Canadas and El Teide area. 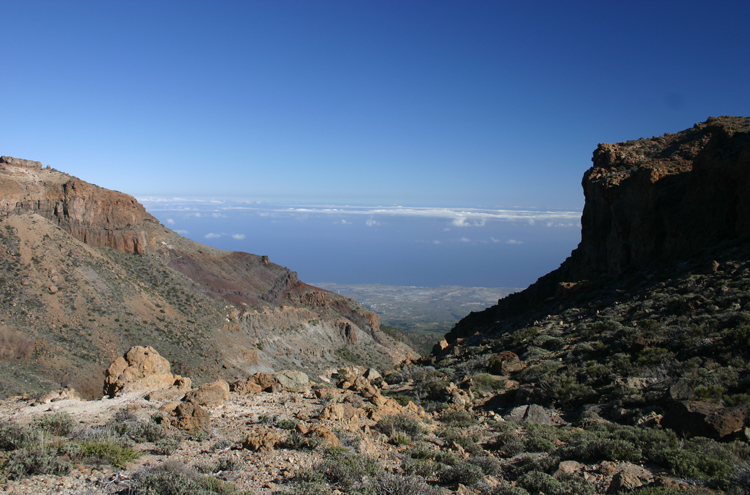 Climb up to the high point of the thousand-foot cliffs that ring the huge caldera, with the magnificent volcano El Teide to the north and a dramatic floor of lava flows. Volcano-nerd heaven and Top 100 walking. 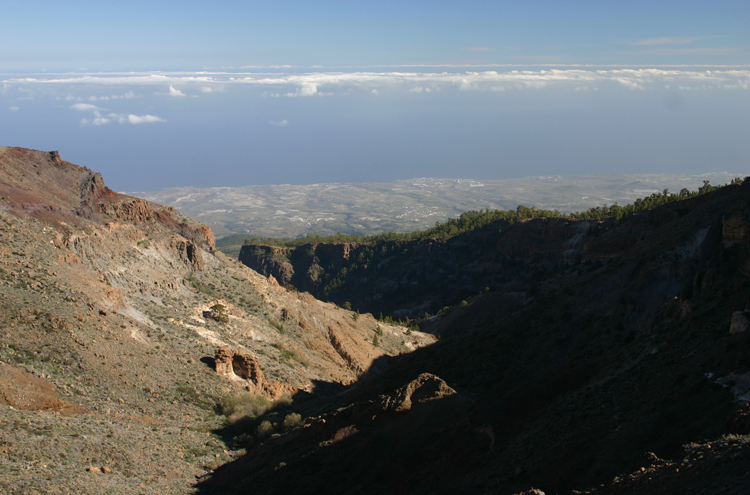 Huge views over the crags and chasms of the caldera; and, from the outer slopes, across craters, fumeroles and barrancos down to the ever-present sea. This is demanding walking in serious mountains: prepare. 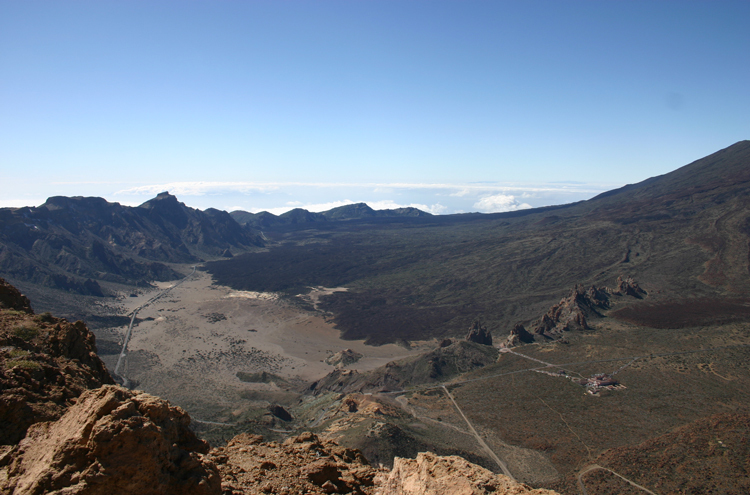 The walking gem of Tenerife's extraordinary crescent-shaped Las Canadas caldera, and thus of Tenerife itself, is the peak of Guajara on its southern rim. 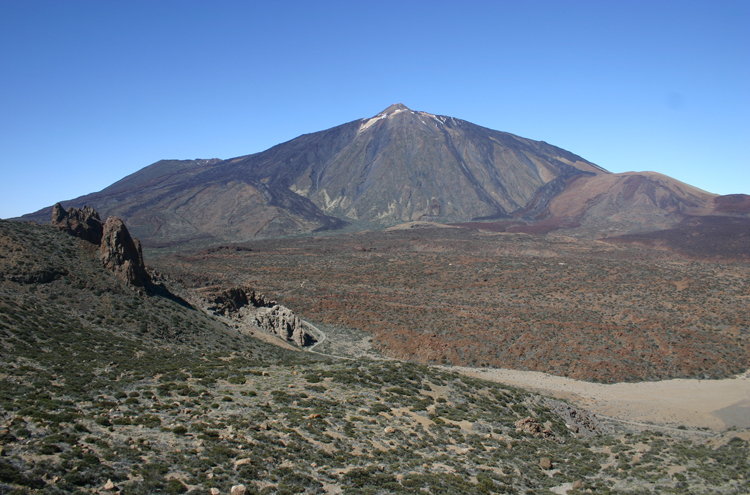 The great volcano of El Teide, that now fills the abyss created by the collapse into the sea of the huge volcanic Canadas Edifice dwarfs, at 3,718m, all around it, but is actually a less satisfactory walk. 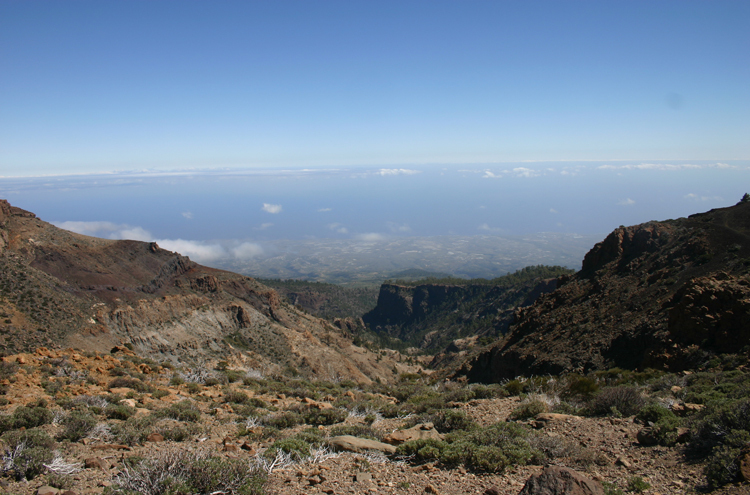 The 4 hour climb of 2,715m (around 9,000ft) Guajara is a generous walk, providing a huge range of delights. 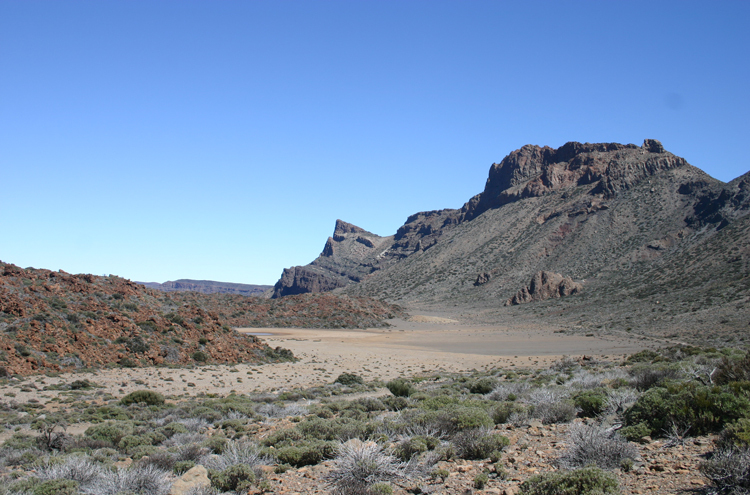 You start on the caldera floor at The Parador hotel, crossing the rocky remains of an old lava flow, joining the 17km track below the thousand-foot cliffs of the calderas southern rim, itself one of the areas great walks. 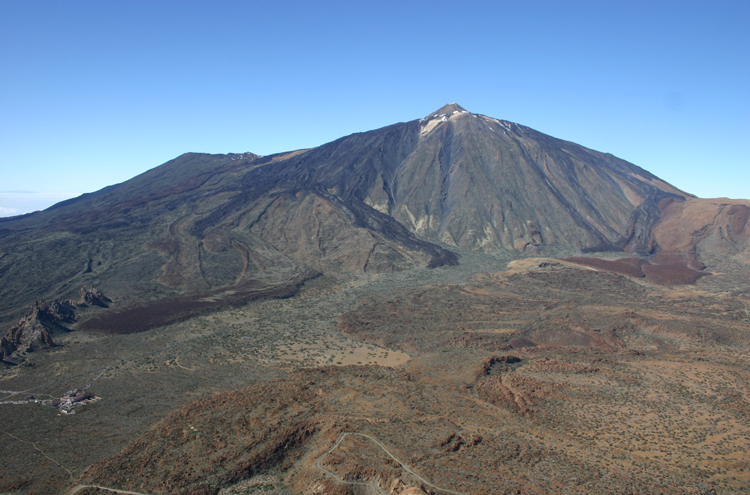 Here, immense lava flows have swept down from Teide, in places right to the base of the southern cliffs, but often coming to a halt short of them. 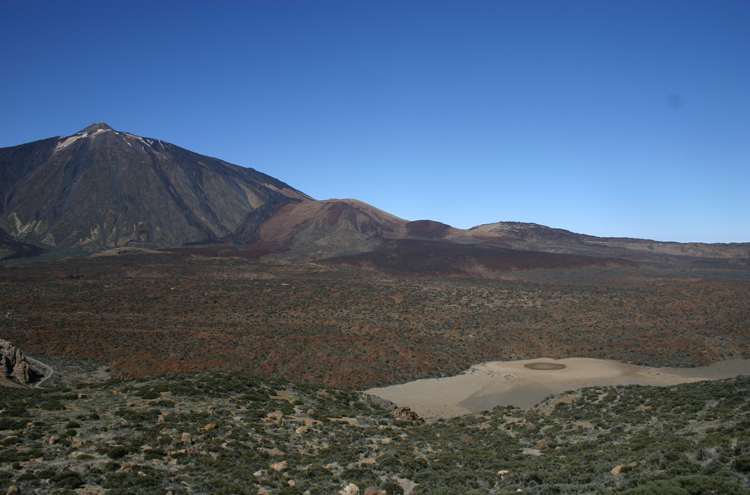 Into these unfilled spaces, wind and water have swept pale volcanic gravel to form mysterious flats, called caadas, between the crazed rocks of the vast upheavals. 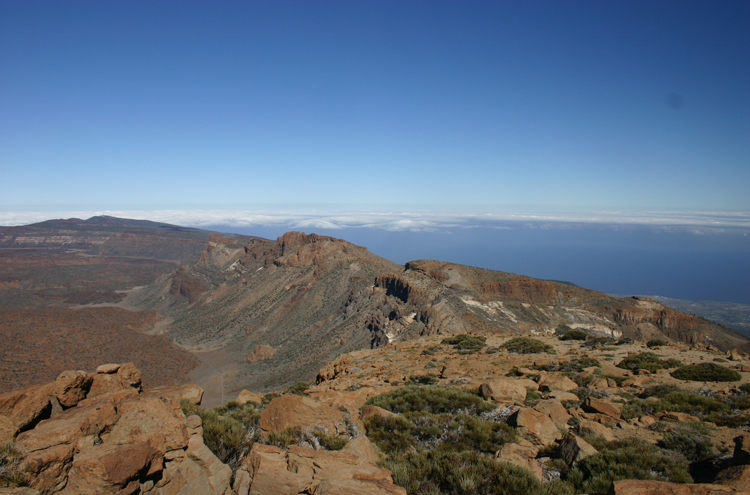 This track meanders from caada to canada, winding over the intervening lava flows, often right below the cliffs of the southern rims first buttresses. 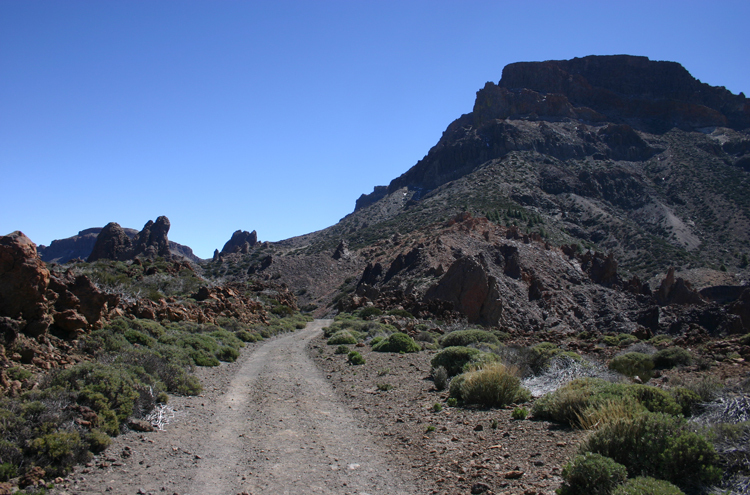 An hour or so out, a path heads south up a slope between the cliffs of two of the rims peaks, to the Depollada de Guajara pass, soon gaining a panorama across the great depression and, with it, a full understanding of what has happened: you can now see the enormity of the hole that Teide filled, and of the lava flows that run down from numerous orifices in its sides, as well as the high summits of the Pico Viejo, which blew some 200,000 years ago, and its offspring and supplanter, El Teide itself, its vast older summit supporting an elegant 150m high final baby grandchild. You can see kilometer-long ripples in these huge flows, with a striking resemblance to huge cowpats, crusty on the outside but liquid underneath for a surprisingly long time, creating kilometer-long caves and leading to collapses. Arrival at the pass some 40 minutes later is a wondrous moment: there, suddenly, is a barranco (a huge couloir) between sheer cliffs several hundred feet further down and with tiny pines perched precariously at the edge, which is framing a glimpse of populated lower slopes and a tract of quiet ultramarine sea. Views everywhere, and all wildly contrasting. 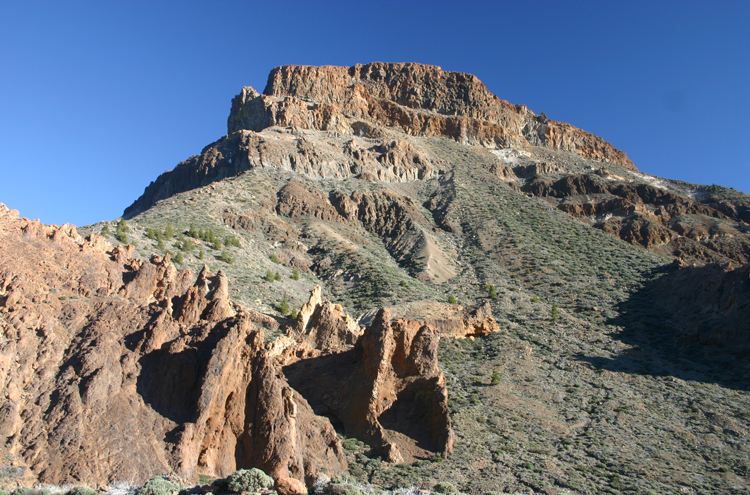 The path winds among the upper cliffs of the barrancos western side, below a strikingly white pumice cliff, emerging onto the long, steady slope to Guajaras peak. This is a lovely climb among particularly pretty shrubs, many in elegantly compact, rounded shapes. 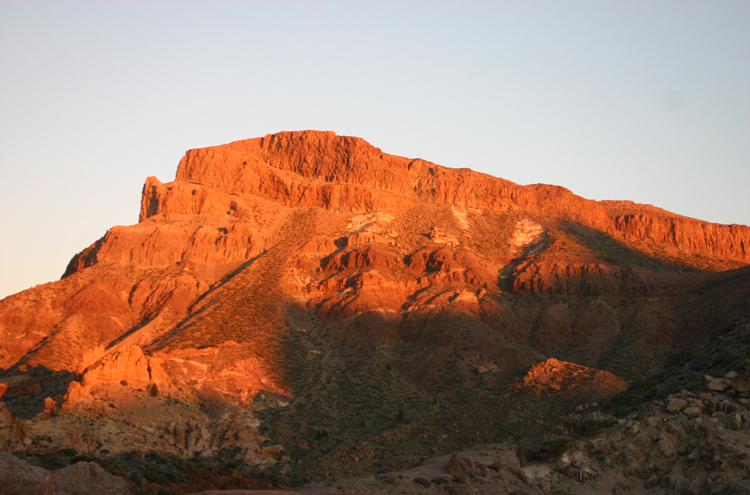 The views from Guajaras flat, bare summit are in the premier league: along the rims peaks and cliffs, now coming into relief with the afternoon shadows, in both directions. 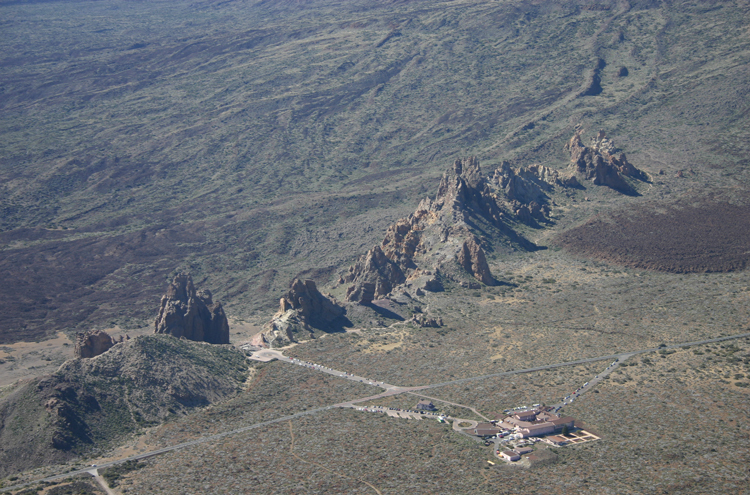 Far below is the spine of the Roques de Garcia, retaining an immense pool of lava to the east, the caada-floored void of the deeper Llano de Ucana to the west. 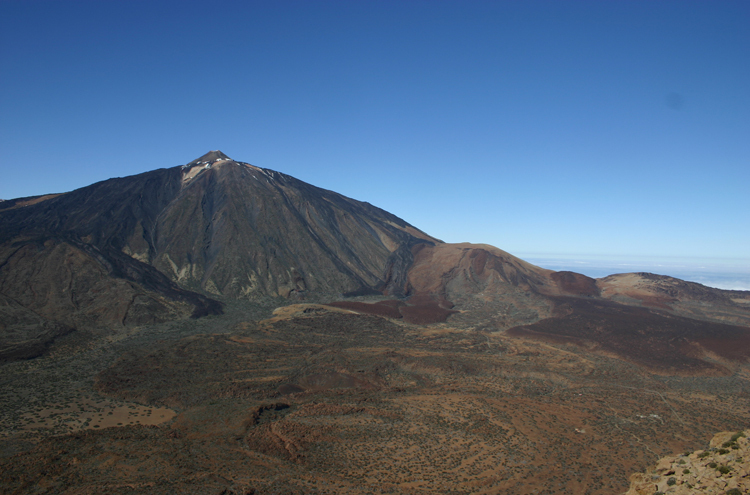 Across the caldera looms Tiede in all its majestic, if not specially beautiful or lovable, pomp. 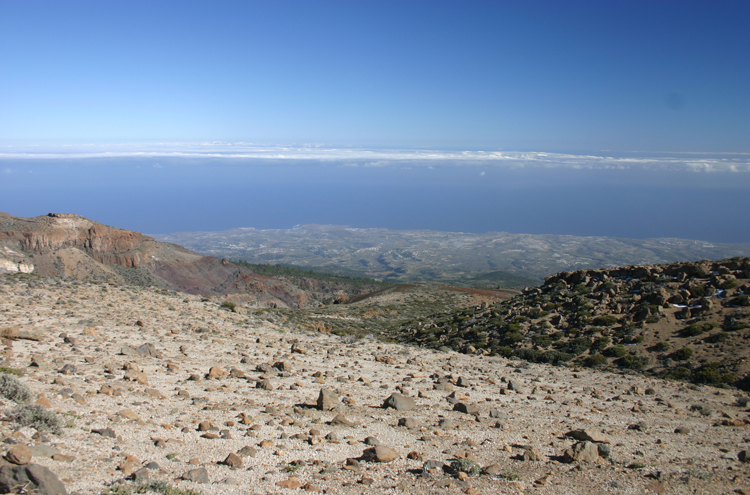 To the south, 9,000ft below but only 15km away, is the dry-looking coastline and a serene sea. There is a steep, tricky path back down the western side of the mountain, but this seems to be actively discouraged except for serious walkers. Retracing you steps is no hardship, as the steady descent and good path leave you free to revel in the views. 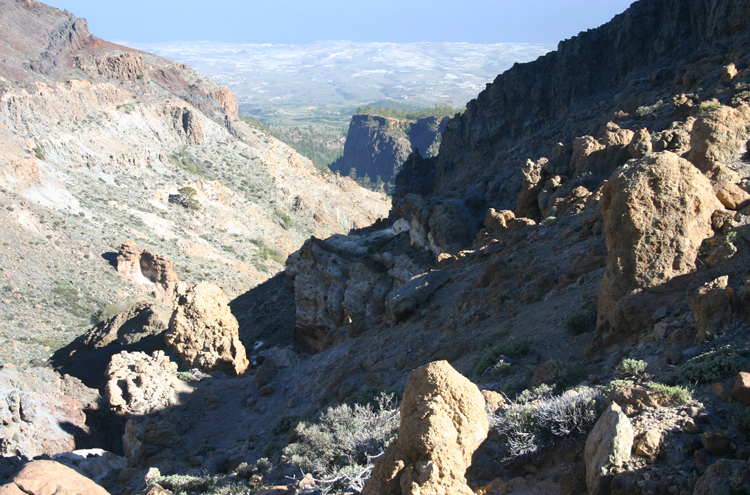 At the pass, we rejoin the ancient trade route back down into the caldera. It is now late afternoon, and the colours are glowing, the distances clearer with the shadows. 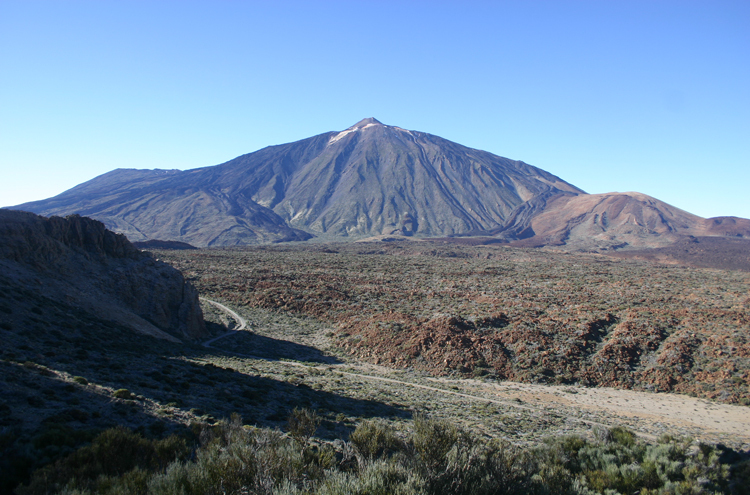 The corrugations and mayhem of Teide's side are chiselled, and you now pay it the homage it deserves. The full, cracked, contorted, rippled texture of the kilometer-long lava flows is now apparent, and the way different-coloured flows overlie each other. 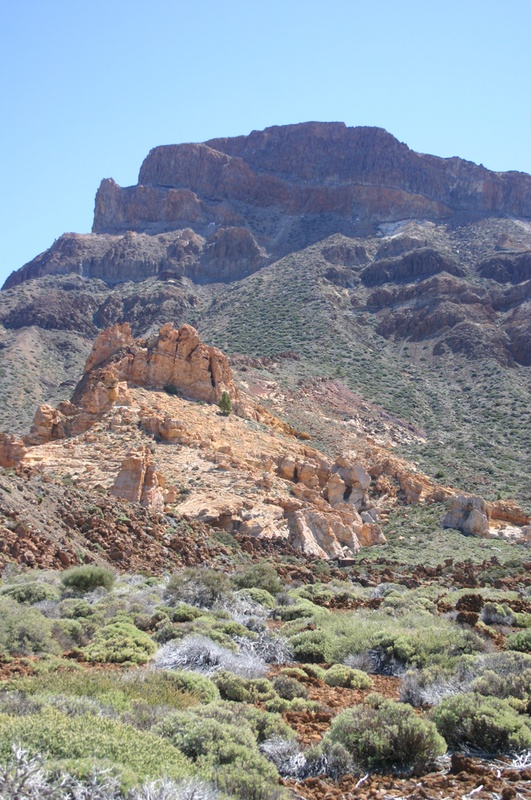 The final tramp out along the cliff-foot caadas track is delightful in the mellowing, colour-creating light. The vegetation contrasts to full effect with the crazy lava walls behind. After a superb 4 hours, you reach the Parador, and a drink on the terrace facing the Roques de Garcia - and the low but powerful sun - as you mull over the many marvels and delights of this walk. By Mysid. License: Attribution-Share Alike 3.0 Unported. 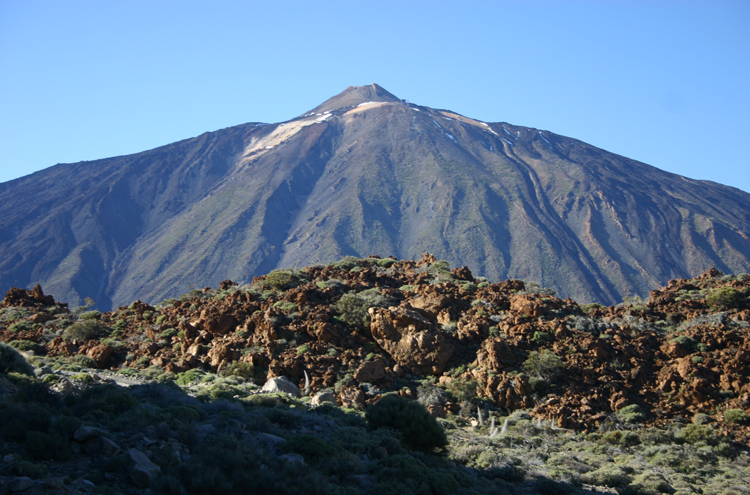 See our Tenerife page for detailed general information.